Day 334: A Mixed Bag . . .
We are a bit tardy tonight (or should we say, this morning) – it was just a wild and wooly day around these parts. Most importantly, young Master Luke, whom we blogged about the other night, had his skull surgery and to quote his parents . . . “So many things today went “better than expected” (quoting Luke’s awesome surgeon). It has completely changed his outcome. We have learned so much in four years. Praise God for modern medicine and you for some serious love and prayers.” Thank to each of you for your support of him. Our day was spent venturing cross-country to Kerrville to spend the day working on our house there. Gotta tell ya, it is truly amazing to us what little regard some people have to something that really doesn’t belong to them. As Brian exclaimed at least half a dozen times today as we went through the house, “Really? Why would they do that?” Even though we were there over the weekend, we really didn’t roam too much since they were still technically living there and in the process of moving out – knew we’d have the chance like we did today. Probably THE most surprising this was in regards to the dishwasher. Why does one feel the need to cut the buttons off the control panel of the dishwasher – with an exacto blade? And, why does one feel the need to peel the other buttons of the dishwasher so they, too, can eventually be cut off? Why would someone buy drip pans for a two-year old cooktop? Why would the same two-year old cooktop have MELTED temperature knobs? Why would you break up a coffee table and leave it in the outdoor fire pit? Why would you use Mop N Glo on laminate…and tile? Why would you use a filthy rag to clean your windows . . . the list goes on. These and other life’s questions are difficult to answer . . . causing us to simply shake our heads and move on. Tonight, being a late night – yes, that drive back through SA seemed extra long this evening, we sipped a new wine when we arrived back in SM. 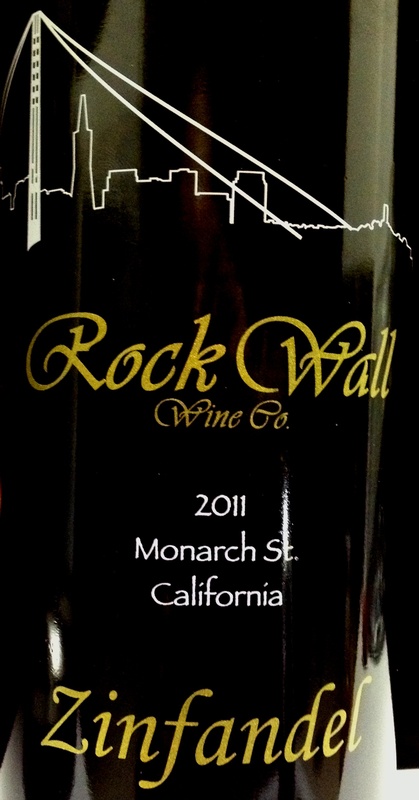 It’s a 2011 Zinfandel from Rock Wall Winery in Alameda, California. How appropriate that after a day of spreading mulch, painting tile grout and door frames (hopefully no body at work will notice the paint flecks under our nails that won’t wash off) cleaning floors, wiping down windows and picking up trash. . .we too have hit a rock wall. This wine is nothing to get excited about. A fairly blah nose gave way to some fruity taste on the palate, but the finish was too quick — especially on a night when a long, luxurious finish would have soothed us! The color and texture of the wine is excellent–a deep dark purple and the swirl in the glass was impressive. There were some hints of chocolate, some slight notes of cedar and other than that, we’d hardly known that we’d opened a bottle of wine. To be fair, because we had hit our rock wall of work on the house, the 2011 Rock Wall Zinfandel may be better than we’re giving credit. Pick up a bottle and you decide! It kinda stinks when something that you own has been disrespected. It really stinks when something you own has been broken or altered and instead of being told, “hey, we kind of had a problem here and so this happened.” No, we have to find out about it by ourselves. It just goes to show that there are all kinds of people in this world. We are FAR from perfect but have a respect for other’s belongings. Too bad some other folks don’t. Have a good day today and enjoy your favorite wine responsibly and remember to recycle whenever possible. Categories: Uncategorized | Tags: Kerrville, luke, Rock Wall Zinfandel, Team Whitaker | Permalink.